Be the first to share your favorite memory, photo or story of Rhonda . This memorial page is dedicated for family, friends and future generations to celebrate the life of their loved one. RHONDA DIANE HANSON, of Bolivar, Missouri, was born on July 10, 1960 in Huntsville, Arkansas, daughter of Duane and Helen (Crow) Oldham. 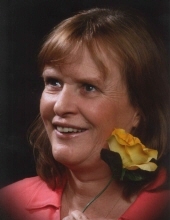 She departed this life on Saturday, February 2, 2019 in Bolivar, Missouri at 58 years of age. Rhonda enjoyed fishing, camping, being outdoors and most of all, she loved spending time with her family. She is survived by two sons, Rodney Gage and wife, Daniella of Berryville and Jeremy Gage and wife, Kimberly of Bolivar, Missouri; four grandchildren, Brianna, Riley, Charlotte and Jaxon Gage; one sister, Joy Howerton of Berryville, Arkansas; three brothers, Dale Oldham and wife, Karen of Pueblo, Colorado, Donnie Oldham and wife, Marsha of Pueblo, Colorado and Bennie Oldham and wife, Marese of Ashdown, Arkansas. She was preceded in death by her parents, Duane and Helen Oldham, and one brother-in-law, Glenn Howerton. To send flowers or a remembrance gift to the family of Rhonda Diane Hanson, please visit our Tribute Store. "Email Address" would like to share the life celebration of Rhonda Diane Hanson. Click on the "link" to go to share a favorite memory or leave a condolence message for the family.